There's something about simplicity that just gives off the sense elegance. 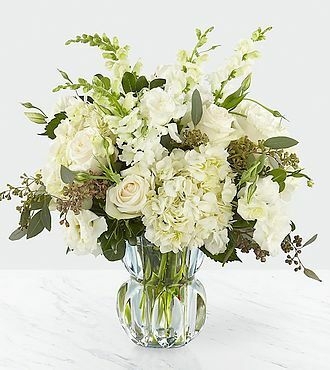 Comprised of classic white blooms and luscious greens set in a subtle blue heavyweight glass vase, the pure beauty of the bouquet instantly draws you in. Vendela roses, snapdragons, and hydrangea capture a truly refined bouquet. This impressive bouquet is approximately 17H x 17W.